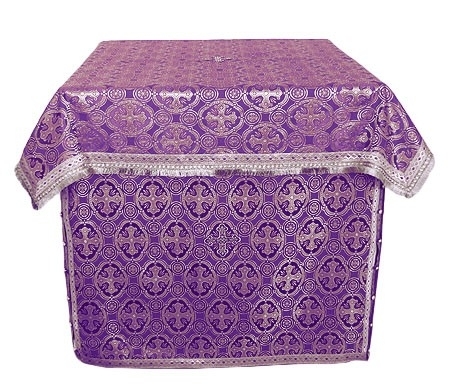 Orthodox Church liturgical Oblation table vestments (violet-silver) by Istok Church Supplies Corp.
Istok Church Supplies stocks a wide variety of Holy Altar vestments including Oblation Table vestments in different color combinations. If you are looking for a unique violet-silver Oblation Table vestment, you have come to the right place. We understand the Oblation Table has sacred importance during the preparation of bread and wine for the Divine Liturgy. We network with reliable fabric suppliers and use best quality rayon and metallic brocades for our violet-silver Oblation Table vestments. Depending upon the type of brocade being used and intricacy of pattern, the prices of these vestments range from around four hundred dollars to over one thousand seven hundred dollars. We provide economy decoration free of cost for our violet-silver Oblation Table vestments. Customers who wish to incorporate better quality decoration can select the Standard or Premium decoration option by paying an additional amount. Customers also have the option to add natural velvet inserts to their order. Prices mentioned are for vestments of a specific size and customers can request for a custom sized vestment by making a mention in the Notes section during checkout. The Oblation Table vestments we offer are full covering and can match the Holy Table vestments we offer. By purchasing both the Holy Table vestment and Oblation Table vestment from us, customers create a harmonious effect at the Holy Altar. Bespoke orders take a few weeks for execution and lead times can be more during peak season. Plan ahead and order in advance if you need it in time for a special occasion. Alternately, customers can avail rush services if they need their vestments urgently. We have satisfied customers from all over the world with our excellent quality altar vestments and exceptional customer service. Purchase all your requirements from us and make amazing price savings!